I have yet another one of these mic problems with windows 10. It all started when I decided to connect an additional monitor. I changed my main monitor to a HDMI cable and used the “white plug” cable on the other monitor. Initially it stuffed up all my sound but I managed to get sound out to get off my monitor (presumably going through HDMI) back to my gaming headset. However the mic just refuses to work despite trying numerous internet fixes like Mina’s guide. My headset is shown as the output device but not as an input device option – I also tried another headset – same issue. Also note that its usually plugged into the front ports on the tower PC (worked before dual monitors) I also tried plugged it into the pink and green ports at the back of the PC, then doesn’t recognise the device at all for input or output. Unplugging the HDMI cable also doesn’t fix it – I guess this has stuffed my settings permanently. Any ideas? Attached are some screen captures that may be of use. I have yet another one of these mic problems with windows 10. It all started when I decided to connect an additional monitor. I changed my main monitor to a HDMI cable and used the "white plug" cable on the other monitor. Initially it stuffed up all my sound but I managed to get sound out to get off my monitor (presumably going through HDMI) back to my gaming headset. However the mic just refuses to work despite trying numerous internet fixes like Mina's guide. My headset is shown as the output device but not as an input device option - I also tried another headset - same issue. Also note that its usually plugged into the front ports on the tower PC (worked before dual monitors) I also tried plugged it into the pink and green ports at the back of the PC, then doesn't recognise the device at all for input or output. Unplugging the HDMI cable also doesn't fix it - I guess this has stuffed my settings permanently. Method 1: I suggest you to run the Hardware and Devices troubleshooter by following the steps below and check if the issue is resolved. 1. Type Troubleshooting in the search box next to Start button and select the top most search result. 2. Click on View all from left side panel of the screen. 3. Select Hardware and Devices, click on Advanced option and check Apply repairs automatically option. 4. Follow the on screen instructions. Method 2: Uninstall and reinstall the audio drivers by following the steps below and check if the issue is resolved. 1. Press Windows key + X, and click on Device Manager. 2. Expand Sound, video and game controller option. 3. 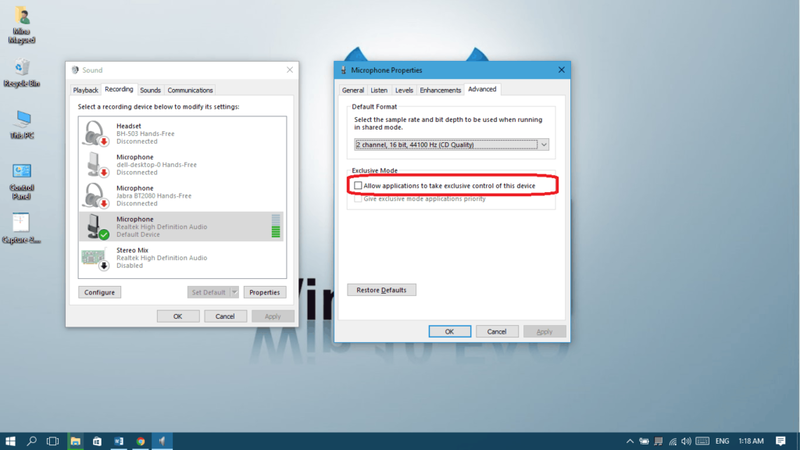 Right click on the sound card driver and select Uninstall option. 4. Restart the computer to reinstall the driver automatically and check if the changes are effective. I hope you come back to tell me how things will go and I’ll be there to guide you further. Good luck! I hope you come back to tell me how things will go and I'll be there to guide you further. Good luck! thanks for your help but no joy – my sound control panel recording tab still doesn’t see my headset at all even though you can find it in the pulldown on the listen tab as above. Note the headset does not have a mute button. I know this is where you have to start, but never had windows built in troubleshooter fix anything. Hello again, I think you need to re-install the sound and display drivers from your computer manufacturer’s update. Let’s start by doing this and see what happens .If you can’t reach the special drivers for your computer from the manufacturer’s official website, please reply with your computer model number and we will do our best redirecting you to it. Hello again, I think you need to re-install the sound and display drivers from your computer manufacturer's update. Let's start by doing this and see what happens .If you can't reach the special drivers for your computer from the manufacturer's official website, please reply with your computer model number and we will do our best redirecting you to it. thanks for your help but no joy - my sound control panel recording tab still doesn't see my headset at all even though you can find it in the pulldown on the listen tab as above. Note the headset does not have a mute button. Hi Mina, its a generic desktop PC built by a local computer store so not a brand name PC. Runs Intel i7-6700 with GeForce GTX970. Someone has also suggested that an app like Discord or Teamspeak is “capturing” the mic. However, it doesn’t work when we use discord…. try it and tell me which motherboard you got. Yes he’s right, but you can overcome this by (quoting from the guide) unchecking “Allow applications to take exclusive control of this device” checkbox and click “OK“. (Also uncheck the “Enable audio enhancements” check box if found). I just got an idea, can you try to return to a single monitor setup while not using any HDMI cables? I have a little concern about it and if it works, maybe we can fix that. Also don’t forget to send me the details you’ll get from your CMD about your motherboard. Good luck! Yes he's right, but you can overcome this by (quoting from the guide) unchecking "Allow applications to take exclusive control of this device” checkbox and click “OK“. (Also uncheck the “Enable audio enhancements” check box if found). Also don't forget to send me the details you'll get from your CMD about your motherboard. Good luck!